This page, published before 2017, refers to the CCAC, now called the Local Health Integration Network (LHIN). Find out more about LHINs. "The name, to start with, is an odd one for people to grasp," says Graham Bird, chair of the Ottawa CCAC, one of 42 in the province and Ontario's largest. "People may not know what CCAC stands for but they sure know what home care is." Established by the Ontario government in 1996 to co-ordinate both home care and long-term care, CCACs aim to help seniors (or Ontarians of any age) stay in the comfort of their homes despite mounting health concerns. If necessary, a CCAC will help find an appropriate long-term care facility or retirement residence. Canadians over the age of 65 now make up almost 13 per cent of the population and the numbers will continue to climb. "CCACs have been growing by leaps and bounds as more and more of our population needs their services and as the recognition grows throughout health care that we're likely to recover more quickly at home," Bird explains. According to the Ontario Association of Community Care Access Centres (OACCAC), funding for home care and placement services has grown from $750 million in 1994-95 to more than $1.16 billion in 2002-03. Last year, the community care agencies helped in more than 533,000 cases, provided 6.9 million nursing visits, more than 18 million hours of personal support and homemaking, plus 1.4 million therapy visits. While home care seems costly, institutional care costs the province much more. CCACs do not charge people for their help, but like anything else in health care, their services are not without limit. Eligibility is based on need, determined by an assessment. While one client may need daily nursing help with wound care, another may simply need the number of her local Meals on Wheels. Not only do CCACs arrange for care from their basket of services, but they also can direct clients to other services that exist in the community, some of which are volunteer-based and others which charge clients a fee. "We have a responsibility that if the client has needs that cannot be met solely by our services, we link them to other community services," says Bob MacWhirter, the care coordinator for the Toronto CCAC. about everything from foot care to food preparation, from speech therapy to palliative care. "It might be an adult child or caregiver or a senior himself who calls with concerns," she says. After meeting with the client, Fowler may determine that what's needed are the services of an occupational therapist, who can make subtle but significant changes in the client's home "a bathtub safety bar, for instance, or a ramp for wheelchairs. "What we can do is make it easier for people to be in their own homes," Fowler says. At the central Toronto location, MacWhirter describes the association as a navigation service. "The government originally set it up as a kind of one-stop shopping. I do believe in that philosophy," he says. "It's less confusing for seniors if they have one number to call and then be guided where to go from there. We can be the initial point of contact." Some CCACs may have more community services to draw on than others, but Dr. Jim Armstrong, the CEO of the OACCAC, says there's a concerted effort to address the disparity between urban and rural areas. "CCACs are working with the provincial government to ensure that the services are more consistent across the province," Armstrong says. He adds that since the launch of the centres, the range and scope of services has increased; for instance, mental health services are now included. What's most important is to respect a client's wishes, MacWhirter says. "I've seen caregivers get frustrated because the client won't do what they want them to do. Unfortunately there is a tendency to 'infantilize' older people. That only sets up a bad dynamic. CCACs help people to maintain their independence from Ontario’s retirement homes." When Anna Storr's health started to deteriorate, the Brampton resident feared her future was about to derail. After a 27-year career as a chartered accountant, Anna retired in 1989 and threw herself wholeheartedly into volunteer work. Feisty and engaging, she was recognized as Brampton's Senior Citizen of the Year in 1997, especially for her work with Peel Memorial Hospital and the Knights' Soup Kitchen. That year, still living in her own apartment, Anna was diagnosed with breast cancer. Surgery helped to beat it, but then her heart and circulation problems began. Her family worried about her staying alone and looked into senior housing options. By 1999, her health had worsened. "Suddenly I could barely cross the room," reflects Anna, 81. Now, thanks to Anna's positive attitude and teamwork with her supportive family, the Community Care Access Centre (CCAC) case manager and home-care help, Anna is back on track. Soon after a quadruple bypass, she got the go-ahead to move into an apartment at Holland Christian Homes, a Brampton seniors community of 1,400. 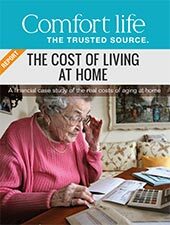 It was a perfect solution to maintain her independence and, with extra care at home, she hoped to avoid moving into long-term care. As is the case with so many seniors, Anna had avoided fully understanding all her options in retirement homes. Part of Anna's salvation came by way of the community care centre, which approved the funded home support, first with post-op nursing care, then with a personal support caregiver. "She's doing fine now with two one-hour sessions each week," says CCAC case manager Shobha Bansal, who tries to see Anna twice a year to make sure conditions haven't changed. The caregiver angel in Anna's life who helps her stay independent is Marie Lewis, a 20-year veteran personal support worker with Spectrum Health Care. Marie comes to bath and massage Anna, wash her clothes and tidy up the apartment. They giggle, laugh and cajole each other. Anna enthuses: "I've been with Marie for four years. She's like a friend and so efficient."